Which surprised me because I thought she was famous. of Authors in 2007, became the youngest ever poet in residence at The Wordsworth Trust, Grasmere in 2010 and in 2013 had her debut collection shortlisted for the TS Eliot Prize, the two Wiltshire librarians I spoke to had never heard of her and there was no mention of her book, Division Street, anywhere on the library computer system. To be truthful, not many poetry books were to be found at all, and certainly not in Trowbridge Library, my local branch. And really, I have to blame myself. I am a poetry reader but, up to now, I’ve bought poetry books and pamphlets when they’ve taken my fancy and I’m sure I’ll continue to do so for as long as my funds hold out. Is it a bit selfish to always buy and never borrow books? But isn’t buying poetry books, and never taking them out at the library, in some ways, like someone buying an artwork to hang on their wall at home, so that all the pleasure is theirs, and their family’s, alone? If we request a poetry book at the library and the library then buys the book to stock on their shelves, it follows that, potentially, more people will read the book. So I’ve requested Division Street. There’s no guarantee that Wiltshire Libraries will buy the book in – I’ve been told that my request, and all requests for books not currently stocked, will be mentioned at the next relevant meeting, which is soon. I’ll let you know what the outcome is. Perhaps you already read poetry books from your local library (in which case, I wonder which books you’ve taken out?) If you don’t, I wonder if you’ll think about doing it. There probably aren’t enough of us to make a massive difference… are there? 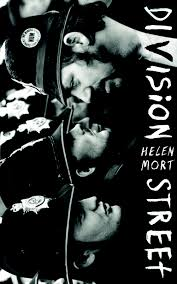 But I suspect that if Division Street does arrive in Wiltshire libraries, there will be at least two other people who might be tempted to have a read. I fear that they also wouldn’t have heard of more established poets – of Sean O’Brien or Linton Kwesi Johnson or Gillian Clarke. It’s easy to forget just how small a minority read poetry with real interest – I think that Roger McGough, Carol Ann Duffy and probably Seamus Heaney would be known, but for instance I am always surprised at how many people haven’t heard of Ian McMillan, who seems ubiquitous to us poetry folks! Libraries are a pretty good litmus test of what people – particularly people who can’t afford to buy books on the off-chance of liking them – really read. It’s disheartening but encourages me to get poetry off the pages of journals and books, and into wider media like radio and TV! Josephine, I must confess I usually buy poetry rather than borrow – because the poetry sections in most Leics libraries are sadly misrepresentational and under-stocked, (and because I’m often so impatient to get between the covers of my latest must-read that only one-click buying will do). I know a fellow poet, however, who regularly requests poetry publications at Leicester central library and, until cutbacks, they usually fulfilled her request. I’m sure that their current stock is largely down to her doggedness. You’re right, Josephine. And your post has given me food for thought: if we, as poets, wish to see a wider readership of poetry, it must be made more widely available. And, of course, we should do all we can to promote and protect one of our greatest free-to-all public services/resources. It’s a similar situation with short-stories, even in the bookshops. You’re right, Cathum. Like Jayne says, if we ask for what we want, poetry and short stories included, shops and libraries will start to stock our requests. That was a cool thing to do, Elly! and what a result. News here is that I popped in to my local library today and there’s still no news about Division Street. But the head librarian did send another email (don’t know who to) as a reminder.